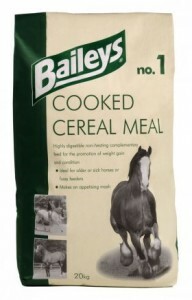 The “original” non-heating conditioning feed, Cooked Cereal Meal was Baileys’ foundation product and, although the formulation has been updated over the years, it remains as effective as ever. It is made exclusively from micronisedwheat, a concentrated source of carbohydrate calories, made as digestible as possible through the meticulous cooking process. This maximises the chances of the starch content being digested in the foregut and helps minimise the chance of digestive upsets or excitable behaviour.The tasty meal can be added to other straights, such as oats or barley, or simply mixed with alfalfa, chaff or soaked sugar beet pulp but, as it is a “complementary” feed, Cooked Cereal Meal should always be fed alongside a broad spectrum vitamin and mineral supplement or balancer. It should also be fed damp or can be made into an appetising mash for sick or elderly horses, especially if they have trouble chewing. If a fully balanced conditioning feed is preferred, Baileys Top Line Conditioning Cubes are ideal and can be easily softened by the addition of water or soaked sugar beet, if necessary.